Know someone that needs a pick me up? This gift is just whats needed. 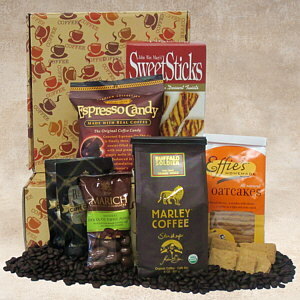 The coffee box comes packed with coffee and snacks to compliment. We've selected an 8 ounce bag of Marley Coffee- Buffalo Soldier Gourmet Organic Coffee. We've also included Effie's Homemade Natural Oatcakes, Marich Chocolate Toffee Almonds, Java Cinnamon Twists, Expresso Coffee Candy made with real coffee, and a couple of packs of gourmet mocha mix.